Perfect Picture Book Friday – The Little Dog In The Middle Of The Road PLUS An Author Interview & Giveaway!!! Whoopee! It’s Perfect Picture Book Friday! But first, here’s the book! Opening: “Once there was a little dog that lived in a pleasant house with a pleasant person on a pleasant street. Brief Synopsis: Little Dog’s person is going away, so Little Dog is left in the care of Mrs. Thistleberry who neither likes nor understands him. Longing for his person, he disobeys instructions and sets out to find her. Links To Resources: check out these fun things kids can do to help shelter pets and give some of them a try ASPCA; 10 Ways Kids Can Help Animal Shelters; dog coloring pages; talk with your child or class about how to take good care of pets; draw a picture of a happy dog or a sad dog or an angry dog – tell or write a story about why the dog feels that way; if you have a dog (or want to donate to a shelter) bake dog biscuits recipe here! Why I Like This Book: Well, you all know I love dogs 🙂 so I was an easy mark, but this story is so sweet even a non-dog-lover will enjoy it. Little Dog is quirky and cute and brave and determined. The story is beautifully written to evoke Little Dog’s emotions – young readers will feel his sadness over missing his person, his determination to find her, his worry that he’ll never see her again, and (spoiler alert!) his joy when they are reunited. The art is just right for the story and includes the delightful detail of an ant pushing an olive for kids to find on every page (which Sharon will explain below in the interview.) And it is based on a true story! For anyone who has ever been left with a babysitter they don’t like, or who has ever worried about whether someone they love will return, this is a warm, reassuring story. And now, for a little treat, please meet Sharon Stanley! SLH: Thank you so much for joining us today, Sharon! Can you tell us a little about yourself? 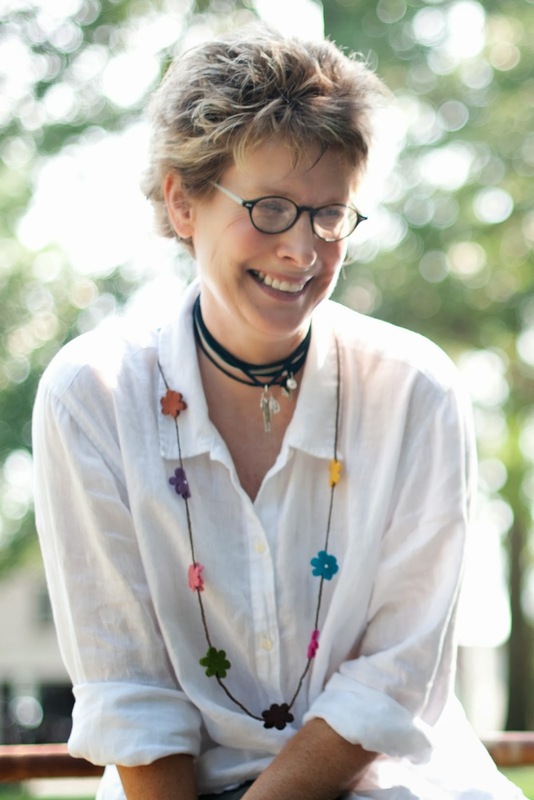 SPS: I’m Sharon P Stanley and I write picture books. 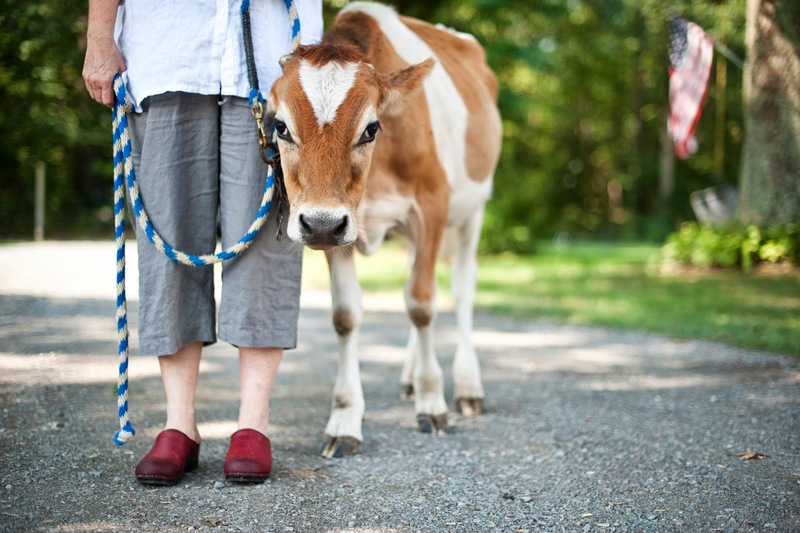 I live with 5 chickens, 4 dogs, 3 cats, 2 sons, and one husband (and a partridge in a pear tree) and a couple hundred cows at White Oak Farm, a working farm in rural Virginia. It’s a crop circle of craziness that affords me a never-ending supply of writing material. Although I had always toyed with writing, I got serious after my youngest graduated high school two years ago. 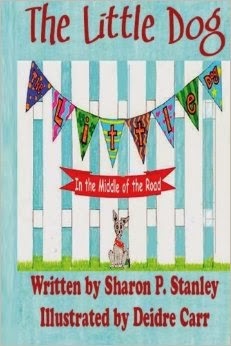 The Little Dog in the Middle of the Road is my first published picture book in print. SLH: What was the inspiration for Little Dog? SPS: My niece found a tiny little black dog sitting calmly in the middle of the road one afternoon. Worried, she carried him home and placed him in the garage leaving a small crack in the door. The next morning when she left for work, there was the little dog once again sitting calmly in the middle of the road. She was able to find his owner, but I couldn’t get that picture out of my mind…it seemed strange for such a little dog to just sit trustingly and calmly in the middle of a busy road, almost as if he knew if he sat there, his person would somehow find him. I had to fill in a few blanks, but the story wrote itself. Coincidently, I was looking for a puppy and right after that, bought Olive who looks very much like Little Dog in my story. When Deidre Carr the illustrator heard this, she added the little ant with the “olive” as a little secret tribute to my own little dog. Very clever! I’m finding little ones seem to love looking for the little olive in the book as they read it. SLH: Tell us about your road to publication! SPS: When I decided to work towards having my book published, I joined SCBWI and an online writing group. I found an editor to review my story and made lots of tweaks and changes over a period of time. When I felt I had something worth reading, I researched and submitted to several small publishers and one agent. I was rejected by the pubs, but the agent was very helpful. We wrote back and forth several times and though she was not interested in the book, she gave me great feedback, and complimented my “voice,” which she thought was a bit unique. I can’t begin to say just how much this helped me. I wasn’t at all sure I had a voice as I don’t have a writing background or education. She gave me confidence to continue submitting. I heard through a writing group there was a small new publisher interested in children’s books, so I submitted. Needless to say I was thrilled when they sent a contract! It’s been a wonderful learning experience. SLH: What’s next for you? SPS: I am so excited to have contracts with another small publisher, Guardian Angel Publishing, for more picture books. I seem to gravitate toward animal stories (!) and also have a book of children’s haiku coming out. I hope to write and write and write till the cows come home. Right now, Little Dog and I are having a ball promoting his book. SLH: Do you have any Words of Wisdom for other writers? SPS: Ha! I’m not a good one to offer advice to anyone as I seem to do things a bit differently from “real writers.” When I get an idea, I write. Otherwise, it seems flat to me. I have found that the books I have found homes for, took on a life of their own. It’s as if they knew what they needed to be, and I tried not to get in the way. For instance, I had a story idea about a donkey, but when the book was finished it was about a rabbit…not a donkey in site. I don’t even know where it came from, suddenly there was just this little rabbit asking to have her story told. I don’t think there is a right or wrong way to write. I think you have to find your voice in whatever way works best for you. When I started writing I set goals and then assigned methods to each goal so I had a real plan. I followed it closely and it worked for me. I knew I wanted to find a small publisher. I like small. I think it’s really important to be true to what feels right to you. For some, that’s finding an agent, submitting to a large publisher, or taking classes. For others, it’s attending conferences, self-publishing or joining a critique group. Working with an editor before submitting is extremely helpful to me. I read several writing blogs and find that more experienced writers are happy to share ideas and advice. I read everything out loud, over and over, and I always have notebook with me in case I get an idea. Lastly, I suggest anyone considering publication read Mem Fox’s hints for writers on her website, and take each and every suggestion to heart. I have her site bookmarked for that very reason. One thing Little Dog and I are really excited about is partnering with a local nursery school for their Book Night. We will be signing books, playing games, and enjoying doggie crafts and snacks in January, and we decided to invite each child to bring a can/bag of dog food for a local dog rescue group in our town. B.A.R.K. will be there to receive our donations and hopefully our local newspaper will cover the story. I’ll also donate a portion of book sale proceeds to the nursery school, so it should be a win, win, win situation! Thank YOU so much for taking the time to join us, Sharon! And now, we have a lovely gift! 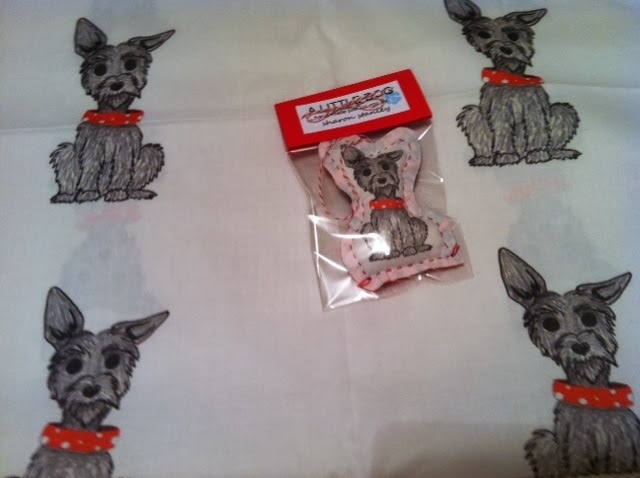 Sharon has generously donated a signed copy of her book for a giveaway as well as a little handmade toy of Little Dog! PPBF bloggers, please leave your post-specific link in the list below so we can all come visit you! Indeed we all do Susanna. The place where we found him trained dogs to assist kids and adults with physical challenges. But he is skittish around loud noises so he could not continue. But he sure knows how to open doors with French handles with his paws and snout! He was also part of a prisoner training program so lived with and was trained by someone learning dog training skills. We could tell he was loved. He has the sweetest personality, just a little fearful of storms and fire engine sirens. Is that the Thundershirt? I heard of that recently and wondered if it would really work. If it does, I'll have to try it on my Baby J! I'll send you a copy! One of my friends told me when she adopted her dog, she went to a shelter, asked the workers who was a really good dog, and they all pointed to Howard, who had been renamed from Killer. She loves Howard so much she named her daughter Elizabeth Howard. No I'm not kidding. I think it's very sweet. I love being Santa for everyone, now including a dog! Wow, that's a great story. Lucky dog. Sometimes I wonder if they know how much they are loved by us! Thanks so much Tracy. I appreciate your sweet comments! It is always so interesting to hear how others go through the process of starting with an idea and ending up with a great story. I can't wait to read about this little dog! I like the idea of goats, too. But alpaca are even more appealing, although I don't really know anything about them. I hope you get your horses! Thank-you for the review and interview. Fabulous as always! Not sure about inspiring, but I'm so glad you could join in the fun! It IS interesting to see how other people write! I love that. Thanks for stopping by! Deidre Carr is a mind reader as well as a wonderful illustrator! How lucky was I??!! I love that this weeks PPBF was a gift for the holidays instead of a book about the holidays. Congratulations Sharon on what sounds to be a wonderful first publication. Not a surprise that you find inspiration for writing in animals. They are a delight. We have three adoptees in our house: two cats and a dog. Our dog Ribbit is a female American Bulldog mix. As her name might suggest, we believe she is part frog as she does not walk or run– she leaps. At 8 she has a leaky bladder and so wears a diaper most of the time. Today she got to wear her purple diaper for the Ravens football game! We saw so many truly abandoned dogs when I worked with Animal Amigos in New Mexico, I can just feel Little Dog's sadness! And I love the event where kids bring a can of dog food for the shelter. Thanks, Sharon, for being such a good friend to dogs! It's sad that there are so many, isn't it Deborah? And lovely when people are willing and able to help! You can't go wrong with a unanimous vote! Ooh – you're so sweet! 🙂 I'll look forward to reading it… although I may not get to it right away with all the holiday contest stories to read this week!